I was helping my grandmother pack up to move from her Moore County home when she called me into her bedroom. “Can you remove that picture over my bed?” she asked. 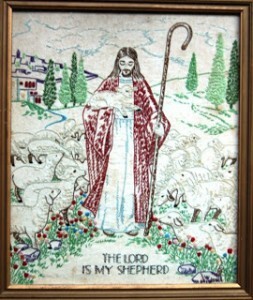 As long as I can remember, the needlepoint of Jesus, the Good Shepherd, hung over her bed. Jesus is surrounded by sheep. In the crook of his right arm is a lamb and his left hand holds a shepherd’s crook. Behind Jesus are hills with a small village of square shaped houses. There are a trees and some flowers and a few clouds overhead. As I took it down, she asked me to take it out of its frame. I did and handed it to her. She pulled back the fabric so that I could see the needlepoint was done on a cloth flour sack. “We had to make do with whatever we had,” she told me, telling me about seeing this painting of Jesus and then creating this needlepoint. It was in the 30s. The Depression was going strong and she was a teenager. In 1954, according to the date on the frame in which she mounted the needlepoint, she hung it over her bed. “I always liked having Jesus above me,” she said with a grin, “but I want you to have him.” Since then, “Jesus, the Good Shepherd,” has been hanging in my home. That same evening, Lionel and Polly stopped by to say goodbye to my Grandma. I remembered them from my childhood when attending Culdee Presbyterian with my grandparents. As they visited, I listened in to part of the conversation between Polly and my grandmother. “Helen, do you remember all those Chicken and Dumpling dinners we fixed for the men in the church?” My grandmother laughed and said, “I don’t think any of them ever went away hungry. It was a bittersweet evening for everyone knew that this was probably the last time they’d see each other in this life. The next day, my Uncle Larry drove my grandmother three hours away to an assisted living facility near his home. For the first few years, Larry would bring her back home on occasion for a few days, generally for Culdee’s homecoming. My grandmother is by far the longest tenured member of this congregation, having joined the church at the very young age of eight. As a young girl, she met with the Elders of the church and testified about her faith in Jesus and they received her into the church’s membership years before her peers. In time, it became harder for her to make the trip. It has been a quite a few years since she’s been back to Moore County. My grandmother has given me so much during my life. I can still taste her persimmon pudding as she always had a pan waiting when I would visit. On a rack in my bedroom are two quilts made by her hands. My dining room hutch is filled with china she gave me when I was ordained. She felt a minister needed to be equipped to entertain. 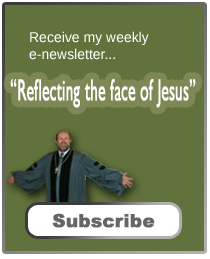 But my favorite gift, which hangs by the front door, is the needlepoint of Jesus. This picture serves as a reminder of another gift she shared to all, the gift of faith.